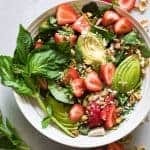 Strawberry Avocado and Pistachio Salad with a Creamy Poppyseed Dressing. All the best flavors combine in this salad. Baby spinach loaded up with juicy fresh strawberries, salty pistachios and creamy avocado. Drizzle it all with an easy to make (and lighter) sweet and tangy poppyseed dressing. Combine all the ingredients into a large jar or measuring cup. Stir to combine or shake until well combined. Prepare the Salad by layering the spinach, strawberries, feta, pistachios and avocado. Drizzle with the creamy poppyseed dressing. ***This salad recipe will feed 2. The dressing will make 4 salads. Dressing will save in the fridge for up to a week. Please stir or shake if separated.